I recently read a spate of warnings about cybercrime in the UK. Here's a quote from Keith Vaz, MP, Chairman of the Home Affairs Committee. "You can steal more on the internet than you can by robbing a bank and online criminals in 25 countries have chosen the UK as their number one target." And today, I got a phone call. The guy at the other end said he was from Barclays. Well, maybe, I don't know that yet. Then he asked my name. Warning bells rang; he's phoning me and he doesn't know my name? So he admitted that he did, he had a list of three names; I was either myself or one of two others, both of who are female, so guess what ... it's me. And I admitted my name to him. Then he wanted me to give him the security information that would identify me. Hold your horses there - I don't know who you are. Before I give out confidential information, like my sort code (which, of course, is on every cheque I send out) or my account number (ditto, so not as confidential as Barclays thinks) I want you to show me that you really are Barclays, and not some scum scammer trying to con me into giving out information that will let you do identity theft. I was a bit more polite than that, but that was the gist of it. And, he didn't have anything. That was Mr Prashant. For just such an occasion, I've given Barclays a password that they can give me when the phone up, to show me that they really are Barclays. So he give me the phone number, and a reference number, so I could call back. Obviously, I didn't call back the number he gave me. I'm not that green. If he's a scammer, then that isn't Barclays number, it's a number that will be answered by someone claiming to be Barclays (yes, I've had a report of that being done). So, I went to my list of Barclays people, and called my previous "relationship manager". He, of course, wasn't there, so I got a recorded message. I called the number that the message gave me, and got a call center. I spoke to Miss Ruchi, but she couldn't verify that Mr Prashant worked for Barclays, and she couldn't give me the phone number of my current "relationship manager" (they seem to change them every few months, I suppose it's to prevent any kind of relationship from developing), because she didn't have it. Then she asked if I was happy with the service she'd given me, so I explained, not entirely, because she couldn't give me the phone number of my current "relationship manager". She explained that this wasn't her fault, she didn't have it, and I pointed out that I wasn't suggesting that is was her fault, but she did ask me if I was happy, and I was explaining why I wasn't. We parted amicably, after I suggested to her that she should ask for the phone numbers of "relationship manager" to be available to her. So then I called my old "relationship manager" again, and got Sandeep. Sandeep was very helpful. At last! He spoke with the people at Mr Prashant's department, and they told him (and he relayed to me) that the problem was that on a recent payment order we'd sent in, one of the digits of the receiving bank was missing. Well, I don't actually believe this; they've had this problem before, and it was to do with some problem between the people we give it to, and the people that they pass it along to. But at least I know what the problem is. But here's a much bigger problem. Every day, bank staff are calling people out of the blue, claiming to be from their bank, and then putting them through a "security check" that asks A) for information that's on every check I send out and B) my mother's maiden name, which I suspect isn't too hard to research, and then maybe more information which might not actually be publicly available, and they expect people to give out this information over the ohone to a comlpete stranger! So that's why I have given them a password that they can repeat back to me, which should be on my file (but I suspect it isn't). And even if it were, Barclays Payment Processing don't, apparently, have access to the files that my relationship manager has. Or, to put it another way, the idea of a relationship manager is so that I can deal with one guy and not numerous weird and wonderful departments all over Barclays, and clearly that isn't working. No wonder cybercrime is on the increase. Not only are people very gullible when contacted by scammers; also our banks are teaching them to give out confidential information to anyone who claims to be from a bank! The GPO couldn't deliver a couple of parcels yesterday, so when I went to the dentist for a bit of grouting, I popped into the PO and picked them up. One was a parcel of four inner tubes. I like to use "thornproof" inner tubes; they are extra-thick rubber, so that they're less likely to lose air when pricked. Usually, I pay £10 for Kenda tubes, but these are Giant tubes and cost me £1.75 each. So I bought four. I was worried that they might actually be normal tubes mislabelled, but they were the real thing. The other parcel was a new electric razor, got from DX for $11.60. It's actually cheaper for me to buy a new razor than to replace the cutters on my Phillips. I gave it a run today, and it works fine. Do all good things come from China now? I'm glad that I couldn't go out today. It's been raining steadily all day long. Tomorrow, I have another late pass, so I'm going north to do a couple of circuits, then on to a geocaching pub event in the evening. Unless, as looks likely, it rains all day tomorrow. In which case, I go on Thursday. Getting wet isn't as awful as it is in winter when the cold gets you too, and I don't mind the occasional shower, but the thought of going out on a day which will rain rain rain, makes me think about staying in the dry. My Raspberry Pi scrolling display is working well. I've modified it slightly - now it scrolls showing the temperature and time, and interrupts to show if I have a big server problem. And I've attached it to a Pi that I was already running in my office, thuse releasing the Pi I used to develop it on. Ladysolly pops in here when she wants to know the temperature outside. I wonder if I can get a humidity sensor? I went to the Isle of Sheppey yesterday. The weather was fine (no rain, but not too hot) and I had a late pass from ladysolly, so I was aiming to do all the caches on the island (30 or so) in the day's outing. Sheppey is very proud of being the birthplace of British aviation; I saw several reminders of that. I started off in the Isle of Harty, where there were ten caches, including one multi. I went round on the bike, and found them all. At one, I found this. This is a reference to the first recorded flight of a pig. 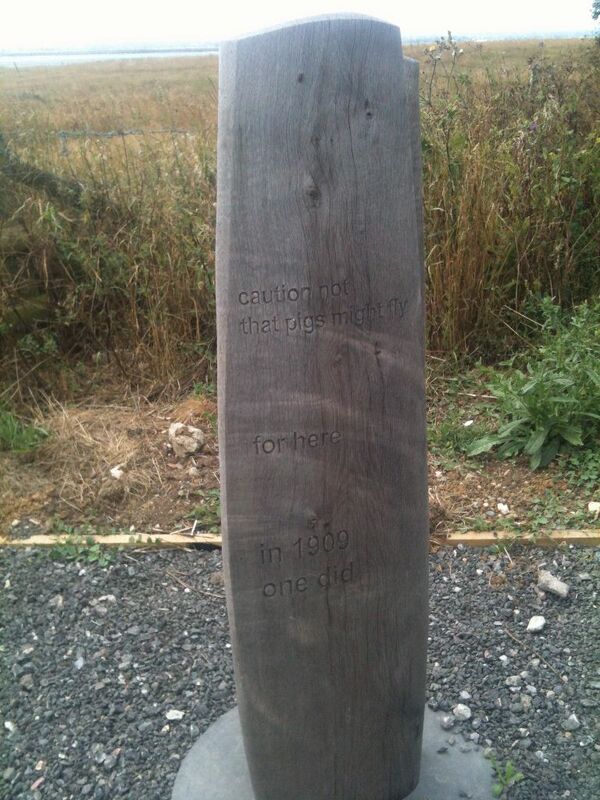 But it wasn't from where the plaque is, it was fron Leysdown, a few miles North of here. There was a great view from here. Then I went to Eastchurch, and did the caches there, including a multi that took me to Leysdown via this memorial. 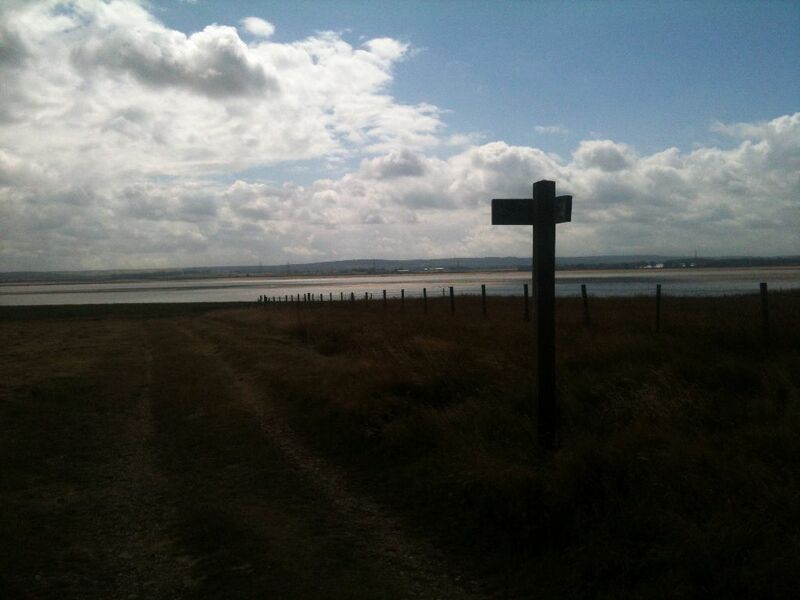 One of the caches there, GC33HVY was my first DNF of the day. It was a tangle of wood and trees, and I just couldn't find a cache. But worse - there was a barbed wire fence, only about ten inches off the ground, and going to and fro, at one point I forgot about it, and instead of stepping over it, I walked into it, and measured my length on the ground. No harm done, although my shins were very unhappy. 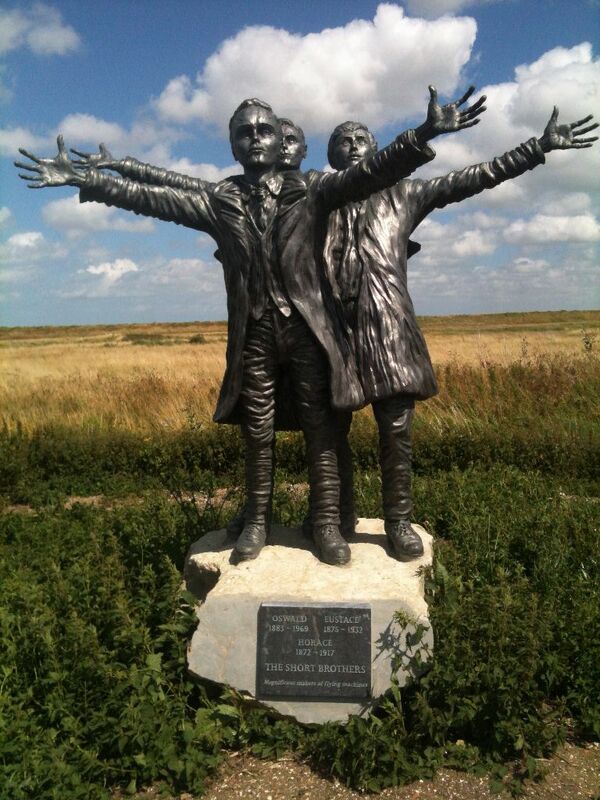 Here's a statue of the three Short brothers, pioneers of aviation. Then on to Minster, for four more caches, with another DNF (a micro on a very heavily ivy-covered tree). My next stop was Barton's Point, where I biked around the Recreation Center, but missed number 6. I found a plaice where the cache should be, but it wasn't a fake plaice. It was fairly fresh, but it won't stay that way. Then to Queenborough; four caches, but in trying to get to "Sheppey Views", I found I couldn't approach via the footpath from the south, I just couldn't find where it came out on the road. So I went round to the North and got to it that way. The view was indeed great. On the way back to the car, the bike battery expired (I'd travelled a lot further than I'd expected to), so I had to rely on pedal power alone; it wasn't too bad, the road was fairly level. 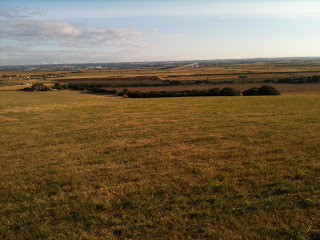 Then to the South Marshes, near where the big bridge runs. There's actually two bridges there, the old one that you can hardly see from a distance, and the new one which rises on a viaduct and can be seen for miles. Here I did a few more caches, including one that's a couple of hundred yards inland from the sea wall. I must have spent an hour biking round a maze of twisty little tracks, all the same. I got to within 60 yards of the cache, but the nettles and brambles were head high, so there was no possibility of cutting off-track to get it. Eventually, I got so lost that I couldn't even find my way back to the sea wall. Eventually, I did get back to the car, but no cache. Going out, I went round the M25 northabout; going home, the satnav took me southabout, so in the course of the day I circumnavigated London, and found 29 caches. By the time I got back home I was well tired, and happy that today I couldn't go out because of a dental. Ladysolly and I went to Bushey today to do a ring of 22 caches, about 5 miles. That distance left her exhausted, and I was a bit tired too. But we found all the caches, and a few of them were rather nice. Part of the route was on a footpath that cut through the Jewish cemetary in Bushey. As we walked along, I looked out to see if there was anyone I knew, but nothing. We stopped off halfway through and went into the cemetary for a bit of a sit down on a handy bench there. We used Geosphere on her iPhone 4 for this. I think it's much better than the Geocaching.com app, and I've worked out how to pre-load it with caches, it's quite easy. I'll try it on my iPhone 3 next, but I'm expecting the GPS response time to be very poor, because it has been on the iPhone 3 with everything else I've tried. I walked in a pair of trainers today, rather than walking boots, because I knew the terrain would be easy, and that the ground would be dry. These are trainers I got a Sportdirect for £7 - they do up with Velcro, so are easy-on, easy-off. I've just bought two more pairs of the same ones, and while I was on their web site, I bought several polo shirts (ladysolly says I look less ugly in those than in a t-shirt, although she phrases it more tactfully) in various colours (mostly blue) and ten pair of socks for a really silly price. I also bought a handful of polo shirts from Ebay, in white. This internet shopping lark is really great. Last night, I saw the last episodes of the Colin Firth version of Pride and Prejudice. I haven't read the book (it always struck me as a girly book), but the TV version was pretty good, so I bought the book from Amazon, Kindle version, at a cost of £0.00. Ladysolly and daughter.2 (who did her degree in English Literature) both effuse at Jane Austen. And she's going on the £10 note, so she must have something good. I got tired of waiting for a phone call from the dealer, and I called them. It's ready - just waiting to be collected. I expect they would have told me one day. The bill is £609.98, not nearly as bad as I thought it might have been. So I'm a happy bunny, and as soon as ladysolly gets home, I'll get her to take me to collect it. Or we'll go tomorrow. I picked up the car. The starter motor cost a lot less than quoted because Landrover paid me a substantial sum for the old one. More than I'd have expected to spend for a second hand one if I bought one. Still, the car works now, that's the main thing. Wonga is a company that makes "payday loans", short term loans, usually to people with poor credit. On their web site is a representative example, £150 for 18 days, repay £183.49. Representative APR 5853%. You might think that a 5853% interest rate is very high. I think that £450 for a Freelander starter motor is very high. I expect my Landrover dealer thinks that it's a reasonable price. It's all a matter of opinion. You don't have to take out a loan at 5853% interest. I don't have to buy a Freelander started motor. It's a free market. I think that 5853% is a very high interest rate, and I wouldn't take a loan on those terms. But I'm not desperate for £150 to tide me over the next 18 days. The Archbishop of Canterbury, Justin Welby, has come out publicly against payday loan companies. Not just Wonga (they're one of the biggest in the UK, possibly the biggest). His idea is that the Church will encourage (how?) credit unions, which aim to make lower-cost loans to members. He's told the boss of Wonga that he doesn't aim to kill them with legislation, he aims to out-compete them. So imagine his embarrassment when an astute journalist discovered and revealed that the Church is one of Wonga's investors. Oops! But only to the tune of £75,000. Minor oops. Usury is a sin. What is usury? That's harder to pin down. In Islam, it's the charging of interest. In Christianity, it used to be the same, and moneylending could only be done by non-Christians - meaning jews. Today, Christians define it as loans with excessive interest rates. But "excessive" is an elastic concept. So, let's look at Wonga. The latest figures I could find for them (Wikipedia) are profits of £45.8 on revenue of £185m. That's 25% profits. That doesn't sound excessive to me. I checked Apple, they're making 23% profit.And if you think about the sort of business they're in, they must have a pretty high number of loan defaulters, and they can't send the lads around to break your legs. They say 7%, which they say is comparable to other short-term lenders. But that still means that 1 in 14 times they lend out that £150, they don't see it back. According to Which? credit unions typically charge 12.7% APR. That's more like it! So I tried to see if I could borrow from a credit union. The nearest one I could find was the Aylesbury CU; that's maybe 15 miles from me. But when I went to their web site, it said "For people who reside in or are employed in Aylesbury". And that rules me out.So I gave it my post code, and it came up with one for people in Harrow or Hillingdon. And I don't. So I can't see any way that I could borrow from a credit union. I decided to check out Milton Keynes Credit union. You can't borrow from them until you've been saving with them for three months, which seems entirely reasnable to me, and you can only borrow up to three times the amount of your savings. Their APR is 26.8%, which sounds not too bad; credit cards are around that level. So if you're a member of a credit union, and you've been saving with them, they'd be a good place to go for a loan. But if not? And if your bank won't make you a loan? I see three possibilities. 1) Go without. Maybe the cash you wanted was for a holiday, and maybe you don't need a holiday as much as you thought. 2) Borrow from Wonga, or one of the other payday loan companies. 3) Contact the Archbishop of Canterbury and ask him to put his money where his mouth is. My view? I'm glad I'm not in the position of needing to borrow from a payday loan company, but I think that what they are doing is legal (otherwise something would surely have been done by now) and ethical, because what you get is exactly what they say you'll get, and what it costs is exactly what they say it costs. I don't get spam from them, and their TV adverts are rather fun. On the other hand, the Archbishop of Canterbury is offering something (forgiveness of sins, salvation, a place in heaven) where there's no way of knowing whether you'll get what he says you'll get, and there's no way of knowing what it will cost, because if you sign up for the wrong god, you could find yourself in a very bad hell indeed. Today, I got a spam from Thomson Data UK offering to sell me their "permission based B2B UK Data". Well, the email address they sent it to is neither B2B (business to business) or has given permission. I was a bit surprised that a company as reputable as Thomson would resort to spamming, so I phoned them up. The person who answered said "Hello?" That's not really what I'd expect from a big company. I explained that I wanted to make a complaint, and he passed me over to Susan. I explained to Susan that the email address they'd spammed should not be a spam target; she said she'd take me off their list. Then I asked where they'd got the list they'd just spammed. "The Christian Marketing Company". It's my experience that any company that names itself after a religion, is highly suspect, and I told her this. She said that she'd had a lot of complaints about this spam exercise, and she was trying to get a refund from The Christian Marketing Company. Then I called Thomson Local, the people who I'd thought Thomson Data UK were part of. I have to emphasise, they didn't say that they were part of the large, well-known group, it was entirely my fault for jumping to the conclusion that because they had the same name (Thomson) and were in the same business, that they would be part of the same company. The person I spoke to at Thomson Local, at first thought that Thomson Data UK was indeed part of Thomson Local, but on checking, they found that the part of Thomson Local that sells email addresses, isn't called Thomson Data UK. So I gave her the phone number of Thomson Data UK and left her to take whatever action that Thomson Local thinks is appropriate. Next, I Googled The Christian Marketing Company. Google found it easily, but when I clicked to their web site, they turned into "Most High Marketing". On their web site they say "we aim to work in an honest and morally upright manner at all times". Well, that's good to hear. Their phone number is 0161 838 5820. I called, but I got a recorded message offering to call me back. I left my number. ... later ... they called me back. Apparently, "Most High Marketing" is not "The Christian Marketing Company". Yesterday I had a late pass from ladysolly, who would be out playing bridge until all hours, so I went north to Conington; there was a new ring there entirely on roads, so a good circuit for biking. But Freda the Freelander is still out of action, so I travelled up in the Volvo, which is a good car, but not quite as tall as the Freelander, so it's a bit more difficult to put the bike in. I parked neatly in a small layby, got the bike out, and went round. Near the end, I saw someone ahead of me behaving suspiciously; that turned out to be geocacher SimplySup, and we had a chat when I caught him up. THen back to the car, and on to the next location. 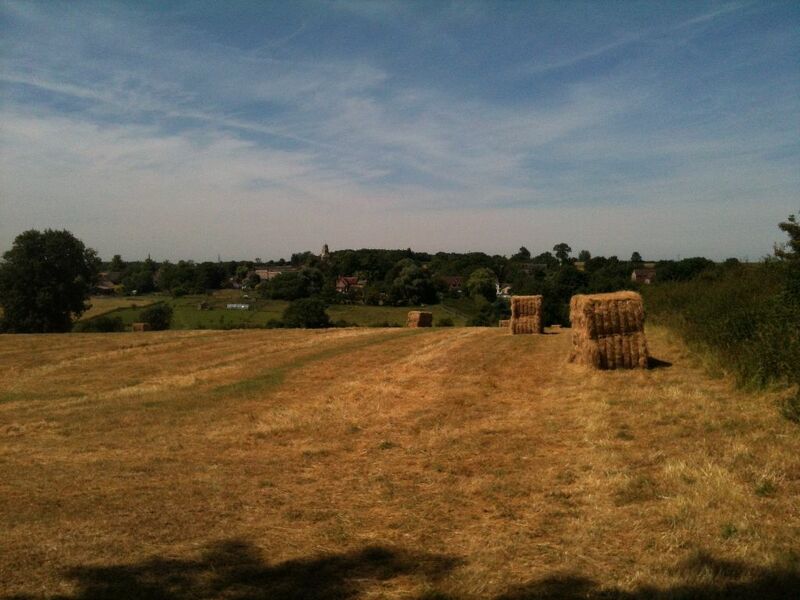 That was Yaxley, where a small new crop of nanos has sprung up. I got the bike out and went round again, including a visit to Yaxley Yabadabadoo 1, which I DNFed when I did that series, and which I DNFed again. Almost everyone else is finding it, so it must be one of those caches that is tuned to be invisible to my eyes alone. I was at the far end to town when the disaster happened. I was biking along, and there was a fairly loud bang from behind me. This had to be one of three problems. 1) someone was shooting at me, or 2) a short circuit in the controller, or 3) a blow-out in the back wheel. I slammed on the brakes. I ruled out number 1, this being England, and the fact that the motor still worked ruled out number 2. And the flat tire made it certain that the problem was a blow-out. Because this was a short ride, I'd come out without my puncture repair kit, so I wheeled the bike for a couple of kilometers back to the car. I upended the bike and took the back tire off. The inner tube has a one inch split in it. So I put on the spare inner tube I carry in the car. But while putting the outer tire back on, I saw that it had developed a several inch long split in the side. What I think had happened, was that the brake was rubbing against the tire until it wore it through, then it went on to destroy the inner tube. Clearly I couldn't use the same outer tire, and I didn't have a spare outer with me. So, I thought, I'll have to cut today's outing short. I went on to do two more caches as cache-and-dash to finish off Yaxley, then I sat in a pleasant shady spot for lunch and coffee. While I was eating, I remembered that I'd passed a bike shop just outside Yaxley. Worth a visit, I thought. And if that fails, there's bound to be several bike shops in Peterborough. It was a very small bike shop. More a bike shed, really, with maybe ten bikes, a few spare parts, and a man about my age tinkering with one of them. I asked him if he had any 26 inch tires, Kevlar reinforced, and he said no, but he did have some ordinary 26 inch tires. He showed me, and I noticed that they were Schwalbe Black Jack. Which are the brand I usually get (from Ebay) and which actually are Kevlar. So I bought one from him, only £13.50 (compared to £11 on Ebay) and, working in the car park just outside his shop, I fitted it. I carefully adjusted the brakes so that they wouldn't rub on the tire, put the bike back in the car, and was ready to continue my day's adventure. That took me to Ramsey, where I trundled round on the bike picking up about a dozen caches including two solved puzzles, and then at 7:30 on to the last ring of the day, the Linwood Loop, which I finished justas twilight arrived, at 9:30. Quite an adventure today! And I did 67 caches, with two DNFs. 1. A bashed-in front, where she dived into a ditch and bashed her nose. 2. A bashed in side, where I left her in a car park for a few hours and came back to see a somewhat crumpled left wheel arch. 3. An additional dent in the side where ladysolly reversed into her. 4. A somewhat dented bonnet, where a cow landed on her as I was driving along. I've never had these fixed, because they don't affect safety and I don't think bodywork rust is going to happen, on account of she's made of aluminium. I also looked at getting a Discovery, but they're a lot more expensive, not quite such a good turning circle, somewhat less fuel-efficient, and only a few inches bigger. Since I know I can get all I need into a Freelander, I'd stick with that. The Raspberry Pi LoL display is running, and I thought you'd like to see it. Biil so far ... £64 for towing it to Landrover dealer, £50 for initial assessment. They've done the initial assessment, and they've determined that the Freelander's computer is incommunicado. It isn't telling them anything. So they don't know anything. I've just authorised another £200 spend, so that they can delve deeper. Maybe us a rubber hose on the Freelander to get it to talk? Ny tongue is reporting a bit of a hole in an upper left back t0oth. I discovered this on Friday at 4:40, but they close on Friday at 4:00, so it wasn't until today that I could make an appointment. I'm not in pain, it isn't an emergency, so I won't get seen until July 30. I'm not expecting this to be a big deal, just a quick dab of filler, a rinse, and I'll be out of there. I hope. Whenever I visit, my dentist offers me a season ticket. The first Landrover dealer I spoke to emphasised how busy they were, but were willing to squeeze me in. The second dealer I phoned were so busy, that when they put me through to the service department, the phone just rand and rang and rang, until I got fed up. I hung up and redialled, and explained the situation, and they siad they'd get someone to call me back. That happened three hours later, by which time I'd gone to a third dealer. I don't like doing business with people who are too busy to talk to a potential customer. I feel that A) it's likely to have an impact on how long it takes them to do the job, and B) adding to their already excessive workload would not be doing them a favour. If you have too many customers, as is clearly the case with these two, I'll help you by not becoming one of your customers. Meanwhile, I called the AA, who explained that because I'd already had a callout on that breakdown, there would be a £50 charge, plus £2 per mile, which I agreed to. They said I'd get visited in two hours time, at 12pm; the car transported actually arrived at 1:30, and (of course) it wasn't actually the AA. I suspect I could have gotten it heaper if I'd gone direct to the transported company. Of course, it would have been cheaper still if I'd got someone to tow me to the dealer, which is only five miles away. But with the engine not working, the power steering and power brakes aren't working, and although you can steer and brake the car (I know, because I had to do it once), it is extremely heavy, and you have to drive really carefully. And if the towing car had to stop suddenly, would I be able to stop the Freelander in time? Maybe not. So I forked out the extra £64. The dealer is charging me £50 just to look at the car, and then I'll get an "estimate". And yes, they have very big windows. I bought a little card for the Raspberry Pi, it's a matrix of LEDs, in a 9 by 14 array, costing £20. It's nice for a scrolling display, driven by a Pi. It arrived today, so I immediately got busy with it. It was a doddle to get working; you just send it text commands out of the serial port, and you can make it do anything. Well, anything that you can do with a matrix of 9 by 14 LEDs. My first effort was to make it display "Hello world". Of course. I've got it set up as a scrolling display that shows me the outside temperature (currently it's reading 30 C). But if I get more than a threshold number of server alerts (currently set to 200) then something has gone badly wrong on at least one server (or it might be a comms issue), so it interrupts the temperature display to tell me how many alerts there are right now, and keeps showing that number. I've run the cables neatly and cable-tied them, fixed the controller to the back rack with a home-made clamp, put the unused wires out of the controller into a waterproof padded bag which I sealed with Duck tape, adjusted the brakes, installed a voltage meter to tell me the state of the battery and took the bike out for a test run. It performed perfectly! Job done. If only I could do similar jobs on the Freelander. 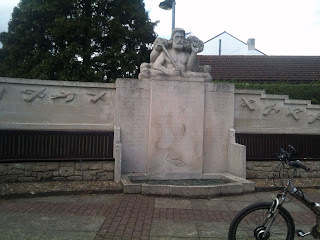 Yesterday, I went to Abingdon. I did one circuit of "Snow white and the seven dwarves", which was rather good, and then I relocated the car to do a series of several which got me the numbers to unlock the lock on the bonus cache, and then relocated again to do the RRR series. I got 39 caches, and a few DNFs on the RRR series. Then I went back to the car in the car park, and it wouldn't start. Nothing. The ignition lights came on, but the starter didn't turn. I tried recharging the battery from my portable starter battery, but the problem wasn't a flat battery, so that did nothing. I tried disconnecting the battery, waiting a few minutes and then reconnecting (which has the effect of rebooting the car's computer), and that didn't work. So at about 7pm, I called the AA. They said they'd be with me at 8:15, so I told ladysolly about the situation, and waited. At about 8pm, I got a call from the breakdown vehicle, and I told them where I was (I'd already given my latitude and longitude to the controller). And at 8:15, the breakdown vehicle turned up. The problem he'd had, was that his satnav wasn't working, and he'd had to ask directions at the police station. Oh, and his big flashing orange lights weren't working either. He had a look at the car, and he thought that the problem was the immobiliser. That's a thing that is supposed to immobilise the car, if it thinks the circumstances justify it. Such as, the car is being stolen. Or the owner wants to go home, having left the car for a couple of hours. And, he said, the whole point of an immobiliser is that you can't over-ride it. So the car needs to go to a Landrover Dealer to be dealt with. But them we had another problem. He'd come with a big car transporter, and that wasn't going to be able to get into the car park, there was a two meter height bar. So how to transport the car? We tried calling the number given by the car park notice, but, as expected, no-one was there. So I suggested, if we had another car and a tow rope, we could tow my car to outside the car park, and then put it on the transporter. But we didn't have another car, and when he called his base, they seemed to think that getting someone to come out with their Discovery, wasn't going to be easy. But they'd look into it. While they were doing that, I pointed out that the car park was very flat and level, and we could push the car to the entrance, at which point we'd be able to load it onto the transporter. He said that this would block the car park entrance for several minutes, but I said that I thought people would accept that. So we pushed the car; it went fairly easily with two of us pushing. And got the car loaded onto the transporter, and I got transported home. At which point another problem emerged - something had gone wrong with the transporter, and it wouldn't go into reverse gear. Which meant that he wouldn't be able to drive in to my front area and turn round. Or reverse into my drive and drop off the car. So he unloaded the car into the road outside the house, we pushed it to just outside the gates, and then I used the Volvo to tow it inside. Home at last! Now I have to get it transported to a Landrover dealer, who will then charge me an arm and a leg for what is probably five minutes work, but they'll pretend I need several new and expensive parts and labour and vat and they must have big windows because they can certainly see me coming. First, why would I want to, when IMAP is so much better? Answer - because GSAK uses POP3, and I don't see an option to use IMAP. And why do I want GSAK to be able to use POP3 on a Pi? Because pocket queries result in an email to my server, which is on a Pi, and I want GSAK to be able to pick up the latest info from my PQs. So. I installed Dovecot on the Pi. Dovecot does IMAP and POP3. Or so I thought. "apt-get install dovecot-imapd" is how I install Dovecot. But that left POP3 non-working, and when you look at the install command, that shouldn't be a surprise. But I've not used POP3 on a Pi before, I've always used imap, and so that's the command I knew. And looking at the config files, it seemed to cater for POP3. But it didn't. I looked all over the web using Google to see how to sort this out, and I tried lots of things. Eventually, in desperation, I went to "
which is, of course, in Japanese, and if I'm working with something difficult and unfamiliar, trying to do so in Japanese ... well. But there's Google Translate, and well I'm blowed, the translation was very understandable, and it gave me the vital piece of information, which is "apt-get install dovecot-pop3d"
So I did that, and opened up port 110 on the firewall leading to my GSAK machine, and it worked! Hurrah for Google, and three cheers for the Japanese person who wrote that page. 15 stone, 8 1/2 pounds. It looks like I put on several pounds when we went away. Sigh. £91. That's what I paid to fill up the Freelander. The tank was almost empty after a long run down the M1, but the cost was £1.35 per litre, which isn't too bad today. It won't be long before I have to part with £100. I bought a pair of sleeves on Ebay; they're for people who will be out in the sun all day and don't want to get sunburned - such as cyclists. So they arrived today, I tried them on, and they were far too small for me. I checked back on the page, and yes, it had said "one size fits most". For an adult male, I'm not that big. Six foot nothing (although daughter.1 claims I'm an inch less) and maybe verging on the burly, but by no means extra large. So I emailed the vendor and complained, asking for a refund. Which I got immediately, without any difficulty. Good for them! And he didn't ask me to send them back. So if you're a lady of slender arms, or a young lad with small forearms, I have a pair of sleeves available for free. I got another spam from a spammer who I'd spoken to before, so I phoned him again. As soon as I spoke to him, he knew why I'd called. Apparently, they made some big mistake and sent their spam out to a bunch of people who they'd taken off their lists. I asked him, "How come, if you've deleted me from your list, you still have my email address to send spam to?" The answer I got was long and complicated, and was to do with some third party that he spammed n behalf of, but I didn't really understand it, even after the second repetition. Not that I tried very hard, because even if I did understand it, I wasn't going to believe it. Yes, I do believe that he made some sort of mistake. But *clearly* he hadn't deleted my email address from his data, because if he had, he couldn't have spammed me again. Duh. I also got contacted back by "The slice". They wanted to see a copy of their spam, and they wanted to know why I thought they were involved. So I explained that the URL that the spam sent me to, was to a page that was a special version for "the slice". And would he like me to send him a copy of that email? Yes, he would. And then I mentioned that the name that the spam had apparently been sent from was "Joanna Hadleigh", and I had several other spams from that same name, for various other products, and I can't think that this is just a conincidence. Not that I thnk that "Joanna Hadleigh" actually exists; I think it's a random name chosen by the spammer who can't be bothered to choose a different name for each spam-out. So I sent him those as well. He said that The Slice didn't have my email address, but that maybe one of their associates did. So I asked him which one. He said he didn't know. So I said "That's good news, because it means that you'll need to contact *all* your associates to ask them to remove my email address from theor spamming lists." And he said he would. And I asked him what action he'd be taking against the associate that was bringing The Slice, and the customers of The Slice, into disrepute, and breaching the PEC Regulation (2003) (which he said he was aware of). He said he'll be firing them. Which I don't actually believe, because rule number one on spammers is that "Spammers lie". But what he isn't expecting, is that I'll give this a week or so, and then call him again to find out what result he's had. 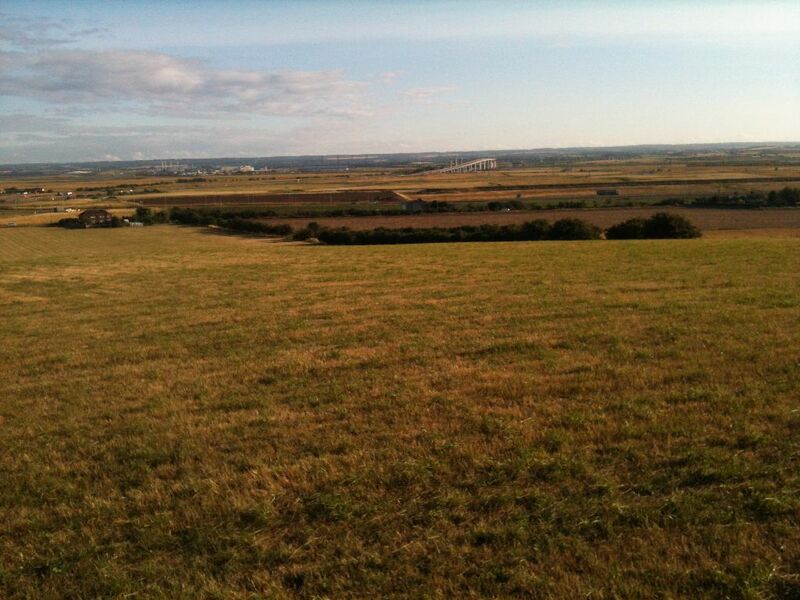 Tomorrow I'm going up North again, to Barham, to do a loop of forty something caches. I hope the heat isn't too bad. North today, to do three rings for a total ot 75 caches! All on the bike, and only one stile to lift over. So, it was a very good day. Here's a great view I shot. It's looking good. Today I finished truing the wheel; it's *very nearly* true. Probably true enough; I'll know better when I test-ride. I can always do a bit more truing later. And I had an idea about the back rack, for panniers, which I need for carrying a spare battery, a few tools and water to drink. This bike doesn't have the lugs that the Haros have, so you can't bolt the back rack on like you can with those. But I googled around, and Ebayed about and came up with a back rack that I think will be fixable onto the Everest, perhaps with the help of a couple of P clamps. Encouraged by that, I put the inner tube and tire (both thorn-resistant) onto the new wheel, and turned it aroundin the forks so that the bike would go forward (the way I had it, it woud have gone in reverse). Then I looked at the back wheel and decided that the tire looked very worn, and the inner tube wasn't thorn-resistant, so I did that as well, because I DO NOT want to have to fix a puncture, or have a blown-out tire, when I'm in the middle of nowhere, eight miles from anywhere. So I ordered two replacement tires and tubes from Ebay, and a bracket to take the PDA. I can see why people accumulate so many bikes. All this must sound seriously expensive, and if this were a car, we'd be looking at thousands of pounds. But it's a bike. Batteries - I already have them. They're actually the most expensive part of an electric bike; about £200 for 250 watt-hours of power (24 volts, 10 amp-hours); I have three of these, and on long days, I get through 2 1/2 of them. Total £178, which is about two fill-ups of petrol, and I've converted an folding mountain bike that I haven't used for ages, into an electrically-assisted folding mountain bike which I will actually use, and I had a lot of fun while doing it. I just checked Ebay, a non-electric folding mountain bike (like the Everest when I started with it) is £150. Install the front brake calliper when it arrives. Sort out the handlebar controls - I need to add the throttle, the PDA holder and a voltmeter. Run the wiring along the bike, waterproof with tape and secure with cable ties. Lunch at The Kitchen with ladysolly's brother and wife. It's a kosher restaurant, which meant I could get chopped liver followed by salt beef. I was tempted by the facon, just so I could see what fake bacon tasted like, but I decided to avoid the likely disappointment. The Kitchen has had some terrible reviews for their service, but we found it to be just fine. This evening, I decided that my colour printer was fading a bit. So I took out the ink cartridge, and re-inked it using some ink I got from Ebay a while ago. It looks great now. Ink bought in bulk like this, is a tiny fraction of the cost of the printer manufacturers idea, which is that you buy new cartridges. And the re-inking operation is very simple. And I feel sure that the ink on my fingers will wear off in a few weeks. Tomorrow I'm going out caching. I have a late pass from ladysolly (she's playing bridge this evening), so I'm off to Margate! Near Margate is Broadstairs. When I was very young, I spent a couple of years at Broadstairs.I went back there a few years ago on a caching trip, and didn't recognise anything there. I spoke to AlienOcean - they agreed that I need a sensorless controller for the new motor. But they don't have one. So I went to here and forked out £22 for their sensorless controller. I seem to be delving deeper into the internals of electric bikes than I'd intended! Apparently, sensorless is better than with sensors; the chap at AlienOcean said that motors without sensors are more reliable and more efficient (more miles per kilowatt). That makes sense; there's less that can go wrong. I've had a controller go west on me in the past (with a smell of burning), but if they're only £22 to replace, that's no biggie. To put the cost of running a bike into perspective, I keep remembering that a tank of petrol costs me £80 and that is good for only two caching trips. No caching for me today, I had to give my routine blood sample; they check how runny it is and adjust my Warfarin dose accordingly. I've been on the same dose, 7 mg, for 15 years now, but they still need to check it every three months. Plus, the weather is *very* hot, so a cool day indoors sounds good. Some more work on the bike with the new Chinese wheel; I had put the controller in the battery bag, but on second thoughts, that will tend to insulate it and it might overheat. So I've redone how it's fixed. The controller is now bolted on to the back carrier, and open to the air. The leads are now wrapped in bubblewrap and sealed in with duct tape; there's no heat to worry about there. I watched "In the Loop" last night. Ladysolly couldn't bear it because of all the swearing, but I thought it was brilliant, as you'd expect from Armando Ionucci. I'm back from spending five days with ladysolly, daughter.1, daughter.2 and grandson.1 at Chewton Glen. I found just three caches (this wasn't a caching expedition), read five books, and put on more weight than I'd thought (I just weighed in at 16 stone 2 pounds, which compares with 15 stone 1 pound before I went away). Now I have to shed that load. The bike motor from Scotland arrived while I was away. It looks very nice, but it only has three leads; all the ones I've seen so far have an additional five. So I don't know how to connect it. I'll ask them, but also I'll do some research. The bank that does my credit card processing, has completely changed the software I have to use, and sent me an email that explained the change very incompletely. So I spent two hours on the phone being talked through making the necessary changes, and I think I'm OK now. I must say, the tech support people I spoke to were really excellent. Pictures from our trip to Chewton Glen. With ladysolly by car to the New Forest. The most notable thing en route was when we stopped for lunch at a services, ladysolly got the coffee, and on coming back to the table put mine down badly, it tilted, and the entire cupfull landed in my lap. I stood up and said a very rude word, very loudly. Everyone else there stopped what they were doing and looked at us. i hopped up and down, and said "Ow". A nearby waitress rushed over, saw the problem, and went off to get coold wet towels, which I stuffed down my trousers over the affected parts. I'm glad to say that there was no damage.